Families, groups and couples, are you looking for an awesome place to celebrate a special occasion or have a relaxing fun filled holiday ?You're in the right place, Beach Villa ticks all the right boxes. Set on a 120 acre private peninsula with gated entry (safe), the villa is spacious (180 square meters) surrounded by park like gardens and will give you the feeling of absolute privacy. Only a 7 minute drive from Russell township.- Exclusive location with breathtaking views, easy access to private beach, perfect to create lasting memories- Bring your boat!, big car park (2 under cover and 2 outside+ turn around area), no ramp on site, but access in Russell.- Keep in touch with friends and family, FREE unlimited WIFI, also FREE use of spa and kayak.-Experienced hospitality professionals on site who will provide you with excellent service. - A $200 bond per booking is required. Payable in cash to management at time of arrival. - Note for couples: The base price includes 2 persons, the use of 1 bedroom andamp; 1 bathroom. Additional rooms and bathrooms may be used at an additional cost. Julien and I really love to travel. Having travelled to many destinations around the globe, it gave us a very good idea about what people are looking for in an accommodation, which is something that we have applied to our own business. We love meeting our guests personally, and we make sure that we are available should they require our assistance. Customer satisfaction is important to us and our aim is to ensure that our guests have a very positive experience when they choose to stay with us. Parking is on-site. 2 under cover parking spaces are available, plus 2 outside parking spaces. ( Turn around area available so suitable for boats as well). Open plan kitchen, access to dining room and main TV area. Salt&pepper, milk, sugar, tea&coffee, dishwashing powder, cleaning supplies. Equipped for 8 persons (plates,cups, glasses,cuttlery) as well as kitchen utensils. Frying pans and pots are also available. Inside dining area ( big dining table, comfortably fits 8 persons) as well as outside covered dining area ( big dining table fits 8 persons comfortably). Main TV lounge 49" flat screen TV. Sound bar in main TV lounge. Several different genres of movies and TV series are available. Large outside area, well maintained lawns and gardens. Easy access,large wrap around terrace, amazing views over the Bay. Second terrace located at the spa area, also outstanding views. We include free rubbish disposal for our guests. As a family we were looking for a beautiful and secluded spot in Russell...Beach Villa delivered that and more! The hosts were helpful and charming and the grounds, view and property just stunning. The Spa Pool and location was just perfect for both day and night relaxation. We would fully recommend Beach Villa for anyone wanting to get away from the rat race and take time to relax. Nice welcome with Sekt and chocolates. Private beach with use of a kayak. Very clean house and in the kitchen use of coffee, tea , milk ,oil ,salt and pepper. Beautiful location with stunning views and private beach. Older property that has been thoughtfully renovated with modern kitchen and bathrooms. Well appointed with comfortable beds and plenty of seating options inside and outside for family or groups to gather. Very clean and well presented property. Thank you for a lovely stay. Kirsten and Julian are lovely host and run a well maintained property. Lovely garden and amazing views. The location is quite and perfect for a lovely holiday. We had a fantastic stay! 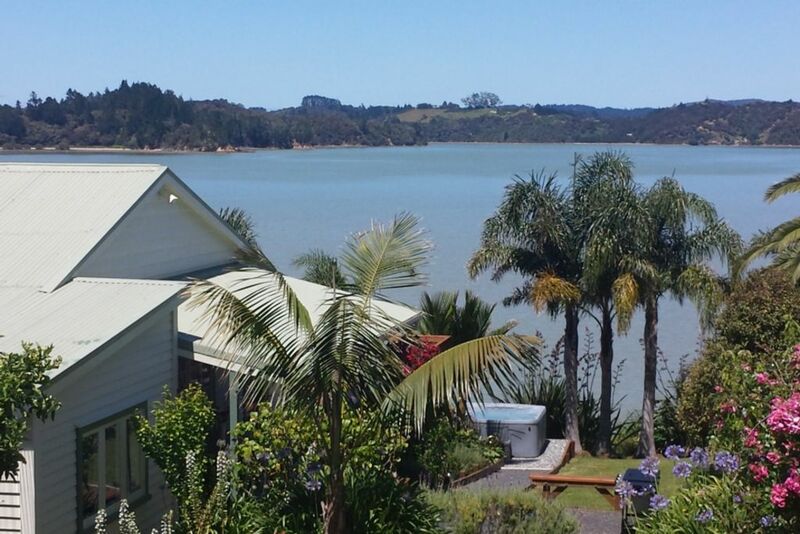 The house is well appointed and the private beach, complete with boat shed is a magical spot. We loved hearing all the birds and picking fresh citrus from the trees each morning. I highly recommend this home to anyone. We hope to be back! Beautiful spot and very well presented house. A relaxing retreat but still close to Russell for activities and meals out.